Ken Kindt, President and Founder of Signworld, and Jack Werner, Vice President of Signworld, would like to congratulate Rebecca and Carlton Walden of First Coast Signs, a Signworld operation in Jacksonville, FL for the recent addition of a large customer with a nationwide presence. By virtue of a contact in Rebecca’s BNI chapter, First Coast Signs is being promoted as the preferred provider of vehicle wraps for Cruise One and Cruises Inc., a cruise vacation agency with representatives throughout the country. Rebecca and Carlton and begun the process of lining up vehicle wraps for these individual reps and currently have completed one full wrap on a Ford Escape, a partial wrap on a Pathfinder and will have a Magnum completed within a week. First Coast Signs had the design concept “blessed” by Corporate Headquarters with the first vehicle, the Ford Escape. The same concept theme is used as other agents come on board and First Coast Signs “retro fits” it to accommodate their vehicles. The agents may select from various approved images provided by the Cruise Lines to feature what matches the agents’ most popular ships and destinations. First Coast Signs was able to wrap the Ford Escape in Jacksonville. Even though the owners live in Atlanta, they were heading to Ft. Lauderdale for the annual sales conference held aboard the Allure of the Seas. The owners dropped their vehicle off on the way down, rented a car for the remainder of the trip, and First Coast Signs owners Carlton and Rebecca Walden drove the freshly wrapped vehicle sporting the new logo unveiled at the conference to pick the owners up at disembarkation. Both the Pathfinder and Magnum are examples of fellow Signworld owners “playing together nicely”. Rebecca reached out to Mike Bothwell, again in the metropolitan Atlanta area to wrap the Pathfinder and Martin Neill in Irvine, CA is on board to take care of wrapping the Magnum in the next few days. By Signworld owners working together, it has allowed Rebecca and First Coast Signs to keep the customer, and allow others to help with installation. 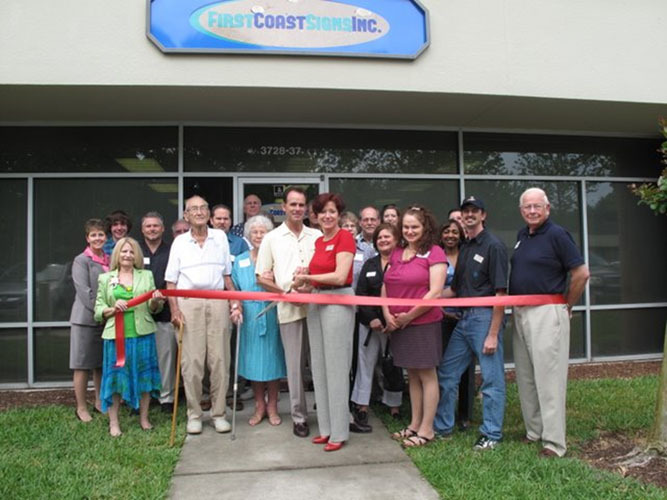 Click Here to visit First Coast Signs.